It’s FINALLY spring after what seemed like a forever winter amiright?! And that means I’m looking at all the light, bright and fresh colors and patterns that are starting to grace the shelves to bring into our homes. Today I’m simplifying the process for you and sharing some of my faves to brighten and freshen up your space! Of course pastel pink makes the list, when is pink NOT a great color?! 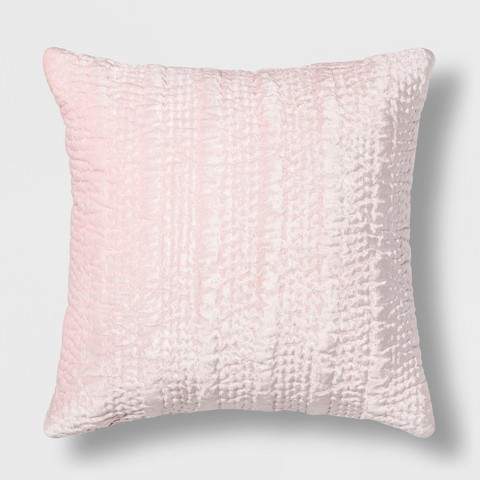 Target’s Opalhouse Quilted Velvet Throw Pillow comes in this luscious pale pink but also cream, light teal, black and teal! I love the luxe feel of velvet and the quilted stitching just ups the glam factor without being over the top. 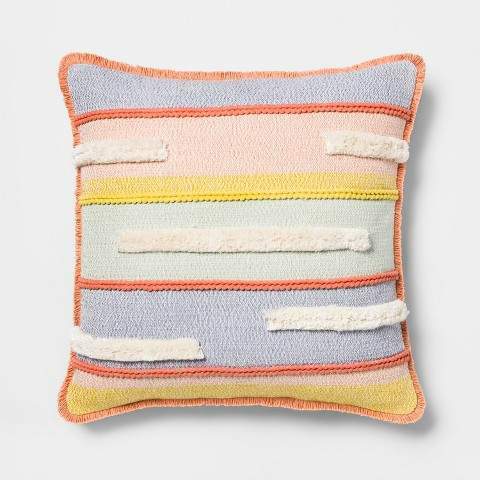 Great texture and pastel colors come together in Target’s Textured Stripe Square Pillow. This is just a fun one! I am seriously OBSESSED with mustard right now (it’s all over our bedroom!) so I had to pop this guy in here. 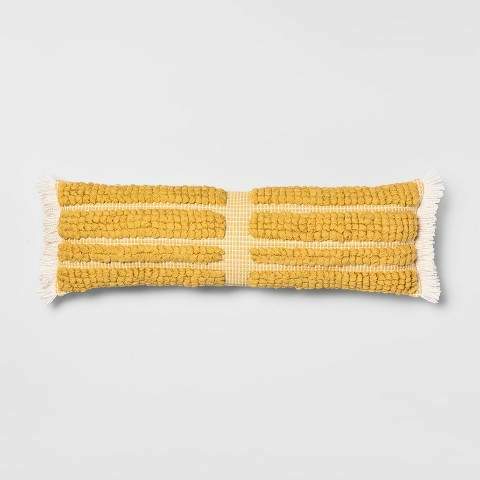 An oversized lumbar pillow loaded with texture and color? I’ll take 2 please! This is Target’s Looped Stripe Oversize lumbar pillow. Another great mixer for the sofa or bed when combined with the 2 above! I have to have another pattern in the mix! 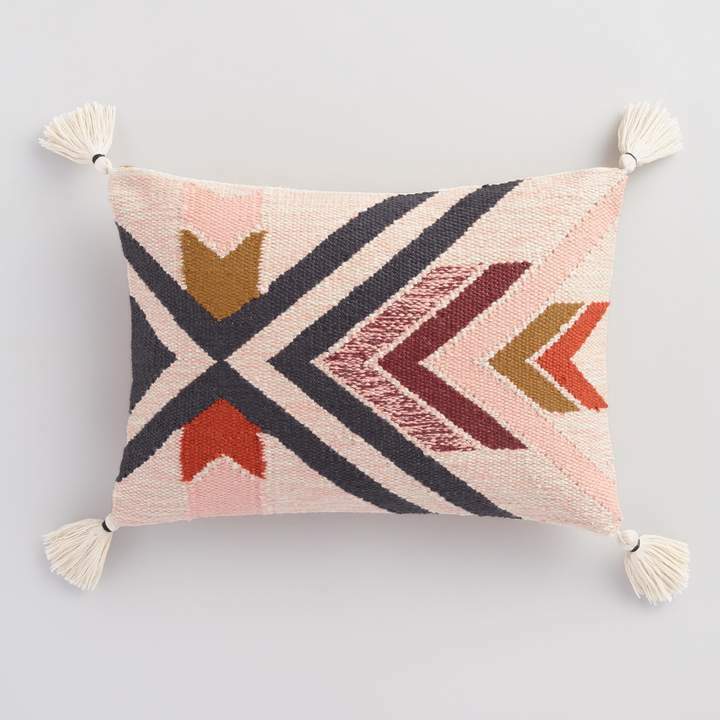 The blush pink, the dark gold/mustard-y color the tassels, this is a fun addition to the others listed above! And it gives a bit more saturated color to even the pastel tones out. World Market Warm Southwest Indoor/Outdoor Lumbar pillow. Here’s another neutral that could work all year long, plus it’s just cute! And it is ALL about that fab round shape, fringe and knitted texture. And it comes in a couple different colors. 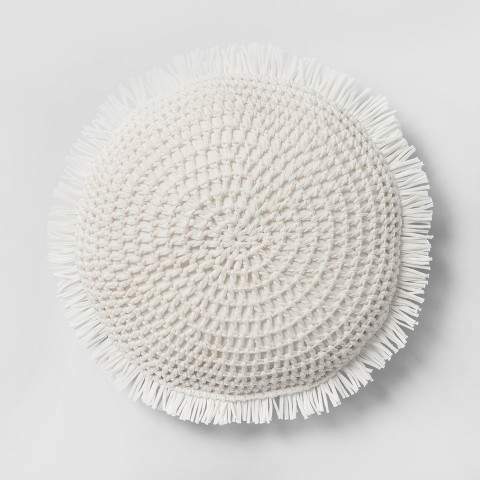 Target’s Round Knit with Fringe Pillow! Let’s talk some window action! I actually have these beauties in my house (fam room) and LOVE them. They are light, airy, provide privacy while letting some light through and have a gorgeous embroidered detail edging. 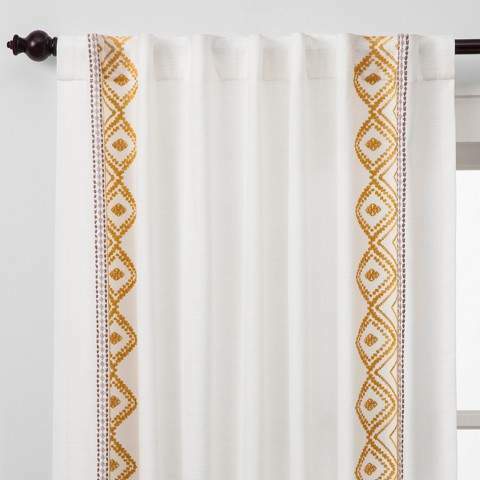 Target’s Opalhouse Global Border Curtain Panel White Yellow. I am planning to order some of these beauties! Pink and orange-y coral are SO in right now and I will personally never tire of them! These are velvet so again another touch of luxurious with the added fun of the tassels. Perfect mix right here folks and in this blush pink, my eyes are so happy right now. 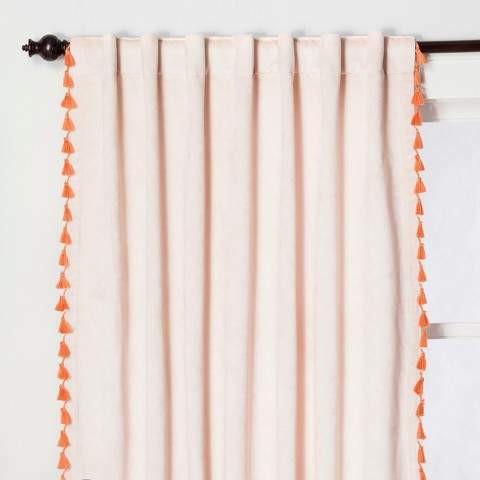 Opalhouse Velvet Curtain Panel with Tassels. 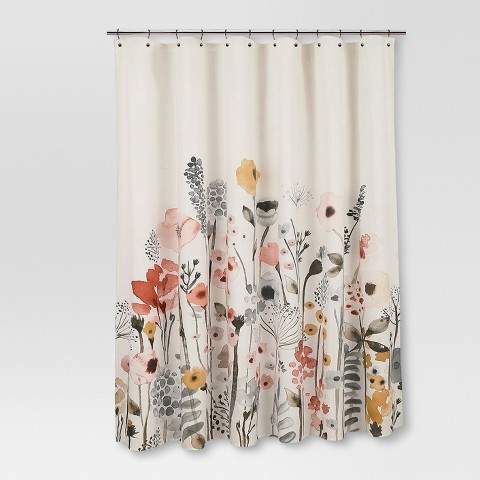 How about a really pretty spring-y shower curtain to dress up your bathroom? We can’t forget about the floor now can we? 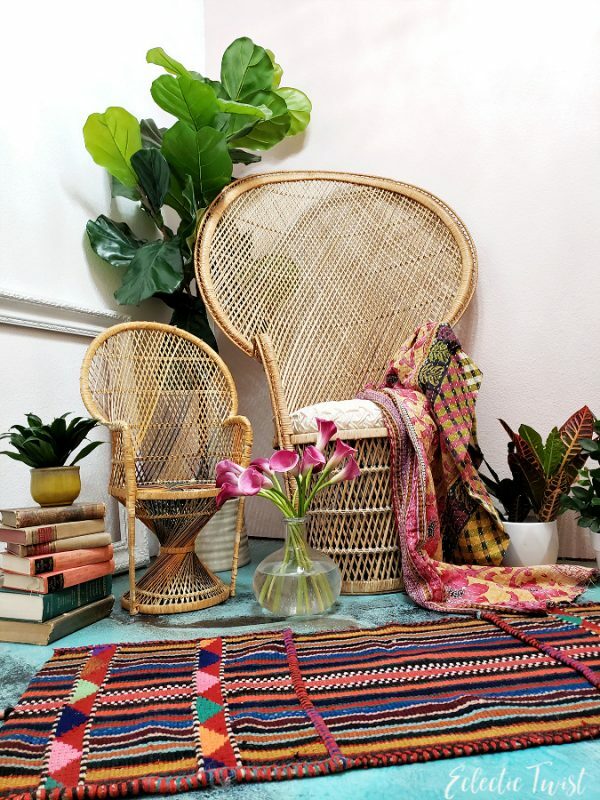 All the spring colors with the bold geometric patterns AND tassels?! Umm yep I’m sure I have a spot for this somewhere. 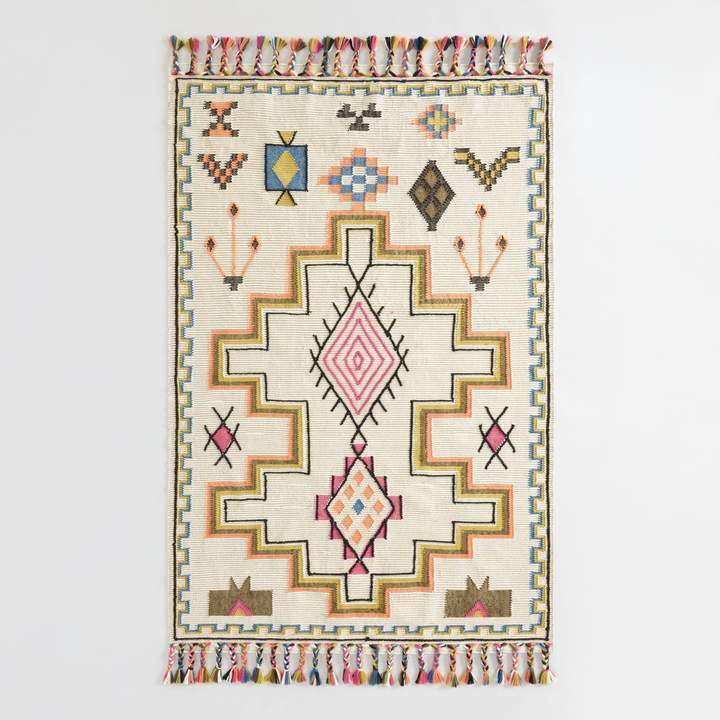 World Market Multicolor Moroccan Kilim Yuma Indoor/Outdoor rug. This is the beauty underneath the top rug in our family room! It’s a fabulous flatweave kilim with all of the colors, I adore ours! It’s gorgeous and easy care, what more do you need? 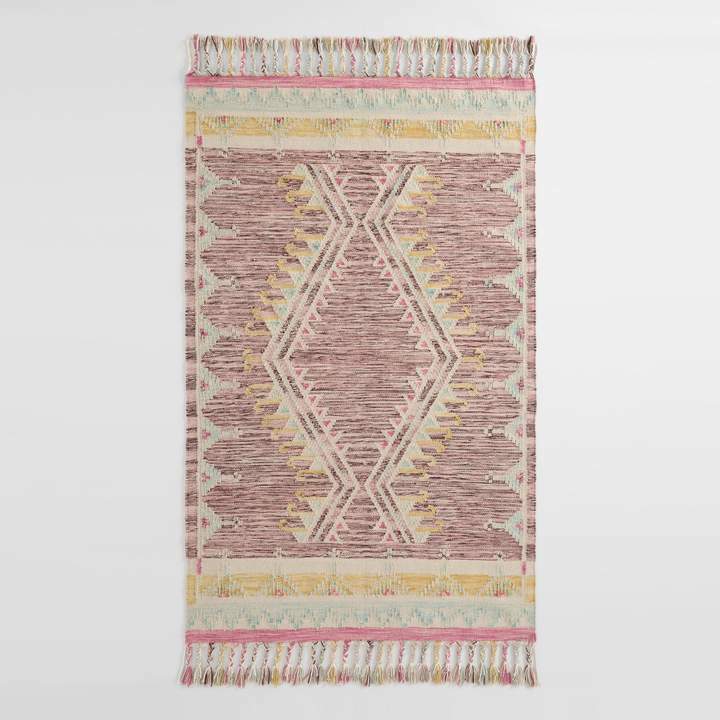 World Market Purple Diamond Kilim Indio Indoor/Outdoor rug. This is another lovely choice, especially if pink isn’t your thing! The fun geometric pattern, the blue, green, yellow and cream. It still feels springy but more neutral. 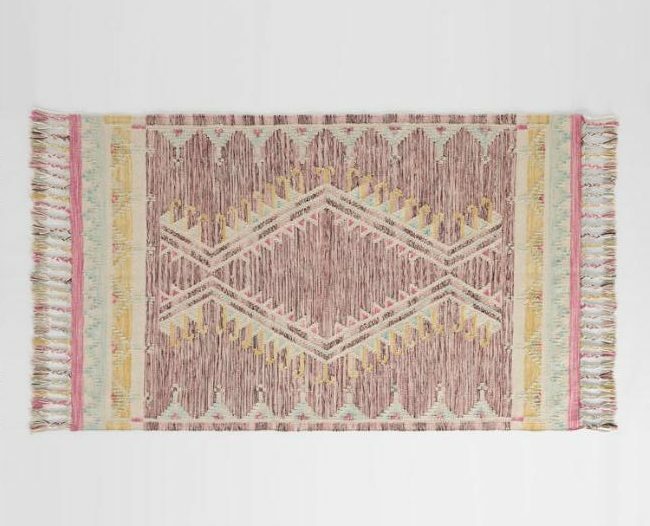 (ok for me it’s neutral haha) A great layering rug or a stand alone piece to inspire your pillow choices. 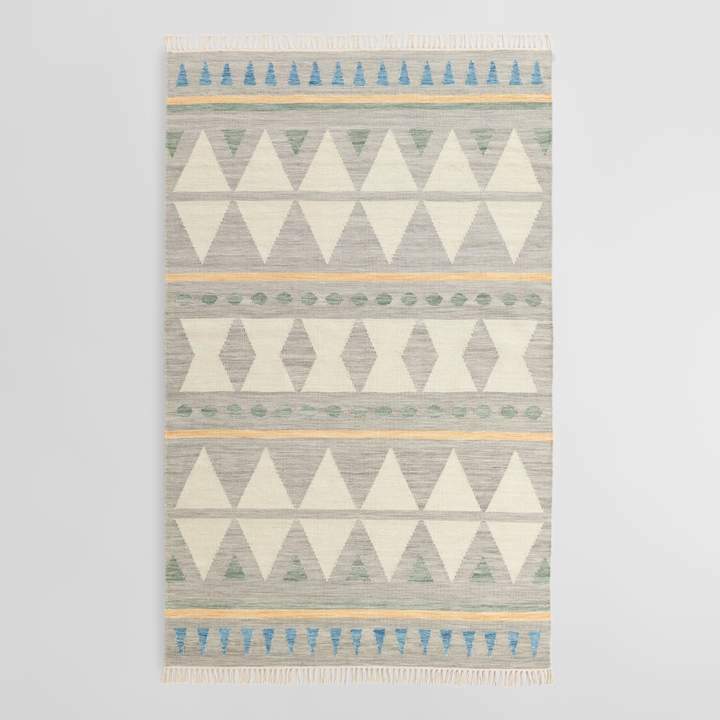 World Market Blue Diamond Wool Kilim Lekan Area Rug. 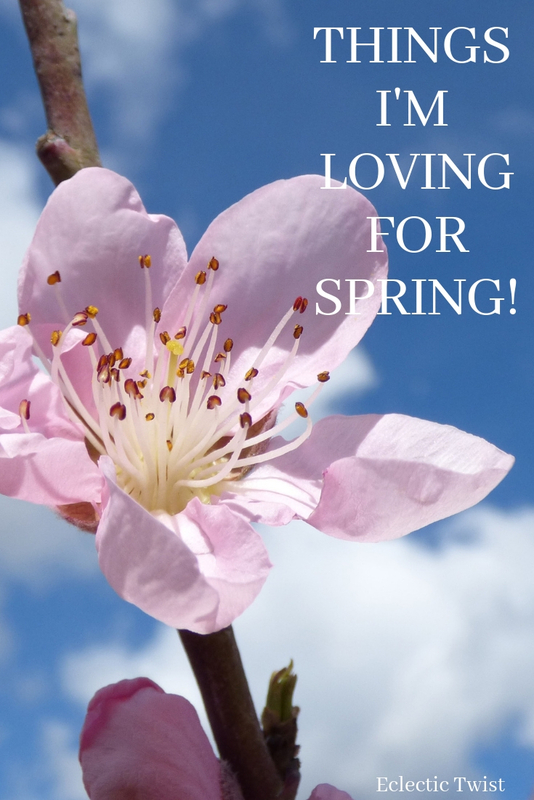 That is a pretty great round up of some of the fun things I’m loving this spring! 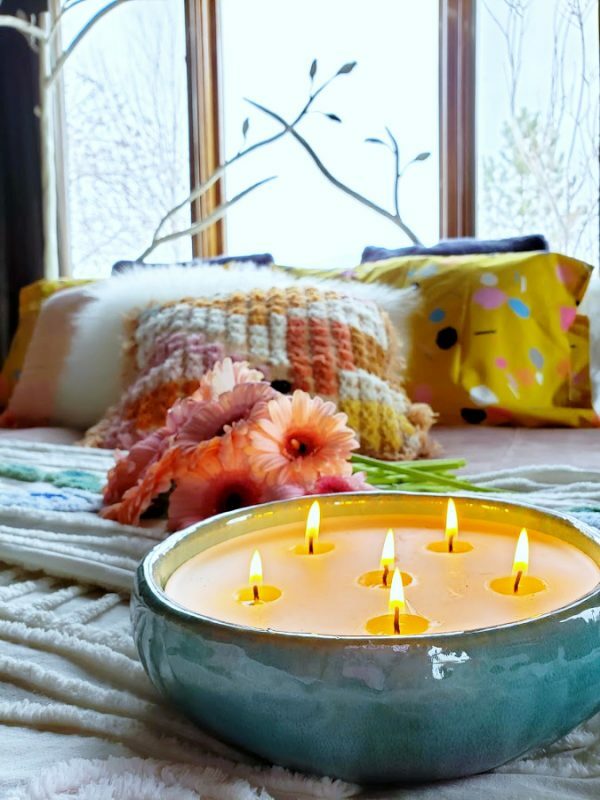 You can use any one or a combo of the things I shared here to create your own spring-y space! What was your fave item? I always love to hear from ya so hit me up in the comments or shoot me an email. And don’t forget to hit up the subscribe box in the sidebar! 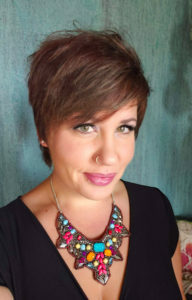 I have some BIG news coming up on next!